Rocky Mountain National Park (RMNP) is a spectacular natural treasure encompassing 415 square miles of montane, subalpine, and alpine ecosystems. Air emissions of nitrogen from agricultural, industrial, and urban sources have contributed to increases in the amount of nitrogen deposited into the Park and are impacting the ecosystems. 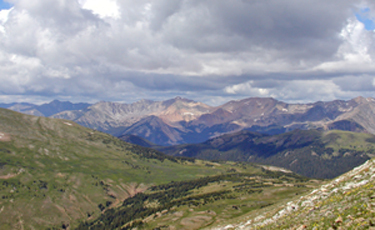 The The Rocky Mountain Atmospheric Nitrogen and Sulfur (RoMANS) study, published in 2009, demonstrated that a substantial portion of nitrogen deposition into RMNP occurs when large-scale, upslope weather events transport air from eastern Colorado and the surrounding region westward into the mountains. Rain or snow produced during these events captures the atmospheric nitrogen and deposits it in the Park. Most of these large weather events happen in the spring or fall. In 2013, Colorado’s livestock and crop producers and researchers at Colorado State University, with funding from the Colorado Department of Public Health and Environment and the National Park Service, began developing a weather-based “warning system” to inform crop and livestock producers of impending weather events that have a high likelihood of moving nitrogen emissions from eastern Colorado into RMNP. By identifying time periods when nitrogen emissions are most likely to have the greatest environmental impacts, producers may be able to temporarily avoid practices associated with nitrogen emissions, thereby reducing their environmental impacts. A weather-based warning system will provide agricultural producers a valuable tool to reduce environmental impacts. The warning system gives producers the opportunity to voluntarily apply certain conservation management practices to reduce ammonia emissions -- practices which may not be feasible for year-round implementation -- during strategic times when they will be most beneficial. Implementation of the system will allow producers to be better neighbors and better stewards of our land and water resources while providing management flexibility. 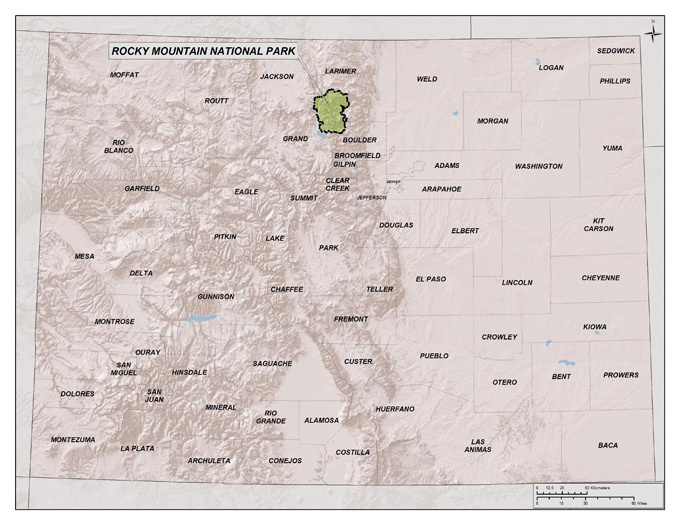 Warnings will be issued when an upslope event is expected to move nitrogen from one of the counties being modeled (shown in yellow) as part of the Early Warning System project into Rocky Mountain National Park. When a warning is issued, applicable dates for the warning will be shown and counties to which the warning applies will be highlighted red.